No. 2, Lorong Kelasah 3, Taman Kelasah, 13700 Seberang Jaya, Penang, Malaysia. 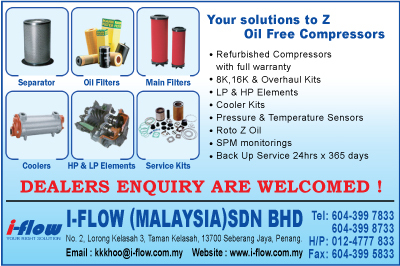 I-FLOW (MALAYSIA) SDN BHD has been established Since August 2001. Since its establishment, I-Flow has been given the opportunity from all type of industries including the Multi National Companies (MNC), M&E Contractors, dealers as well as Small and Medium Industries. 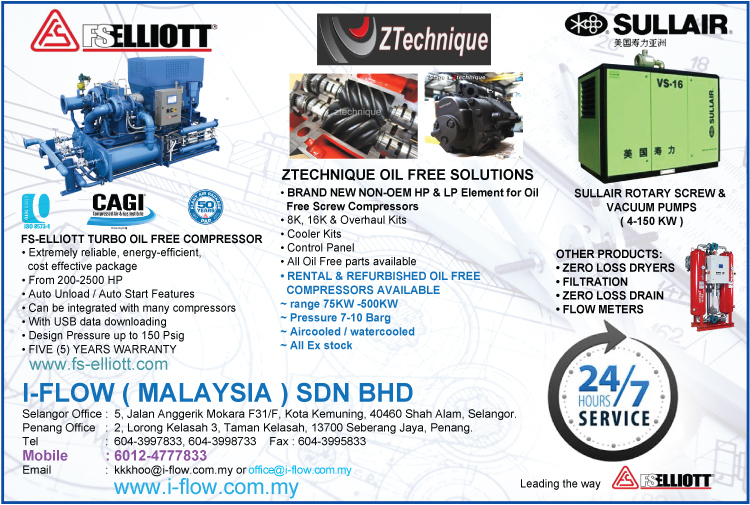 Our range of products includes FS-Elliott Centrifugal Oil Free Compressors, PSB Zero Loss Dryers and Filtration Systems , Pre-Owned / Refurbished / Used Oil Free Z Compressors and Oil Flooded Compressors, Keltec & Mann Compressor parts , air receiver tank, etc. I-Flow also provides a superb after sales and back up services 24 hours X 365 days. We offers a complete range of Preventive & Schedule Maintenance & overhauling for all major brand compressors especially for Atlas Copco Oil Free Screw Compressors from ZR/ZT 37 to ZR750. As time goes by, I-Flow has made a significant impact in the many markets it covers; from Semiconductor, electronics, pharmaceutical, textile, petrochemical, industrial, reconstruction and refrigeration to HVAC industries. Maintaining a close proximity and provide a superb and quality product and services yet competitive to our customers has been a vital factor to our philosophy to success in this field and we accomplish this through our many suppliers, employees and business partners.